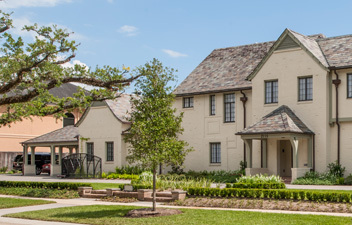 This two-story Tudor-Revival style house was originally designed by Harry D. Payne, FAIA for the Old Braeswood Corporation in 1929. 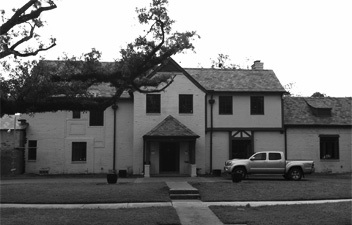 Governor William P. Hobby Sr. and Secretary Oveta Culp Hobby lived and raised their children in the house until 1948.
the current owner purchased the property, the house and gardens had fallen to neglect and begun to succumb to moisture due to inadequate drainage and maintenance. Committed to honoring the property’s history, the current owners wished to revive this family house with the comfortable elegance it had possessed and to adapt it to meet their current needs. GSMA was asked to stabilize and restore the structure and gardens and to replace a prior addition containing a small service kitchen with a sensitive new addition comprising a larger kitchen, utility spaces and wine room. The design of the addition warmly reflects the features, lightness and proportions present in the historic house. The exterior of the addition echoes the half-timber detailing, projecting clinker bricks and diamond diaper brick pattern found on the original house. The careful siting of the addition preserves the quality of natural light in the existing spaces and focuses views on the historic house and garden while minimizing the physical impact of the addition on the historic structure. 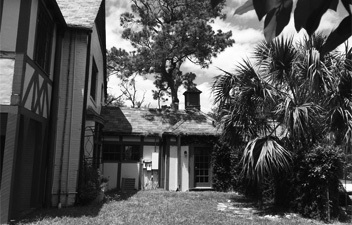 The design of the gardens was inspired by a historic landscape plan drawn for the Hobby family by Allen Myers in 1940, which was found in the attic by the current owners. Moss Landscaping worked to retain the formality, parti, and plant selections of the historic plan while adapting the design to allow for contemporary outdoor entertaining.